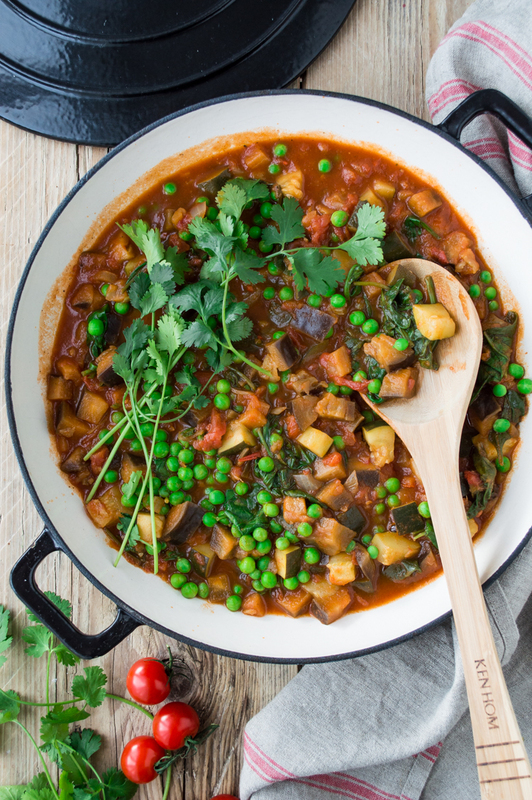 A beautiful combination of warming Indian spices and vegetables, this healthy vegan curry is quick and easy to prepare. Whether you’re making it for a dinner party or for a family midweek dinner, this recipe will be enjoyed by both adults and children, which makes it a total winner for everyone. February is officially the month of romance and love. Call me old fashioned but to me, demonstrating true love and affection doesn’t involve just buying flowers or a box of chocolates once a year on Valentine’s Day. It’s all about nurturing your relationships every day through some simple yet special things. Nothing makes me happier and more content than knowing that my lovingly prepared meal will be enjoyed by the whole family (especially when it involves a 9 year old who is rather choosey about her food…). I must admit, curries have a very special place in our family. Whether it is a quiet family supper or a big get together with friends, curries always seem to be one of the most favourite dishes to cook. I love the fact that you can prepare them in advance, which means you can enjoy your dinner party a lot more and spend quality time with your guests, as those are the moments that matter. 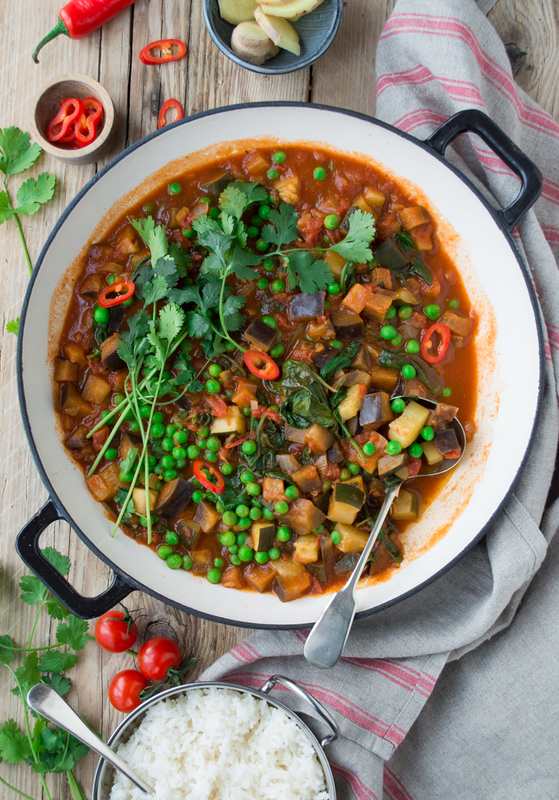 I had a little suspicion that this vegetable curry that I made by following Tesco’s recipe will gown down quite well in our curry-loving family and boy-oh-boy I was not wrong there! When my daughter asked for seconds (which made me feel like a super mum! ), I knew that this curry will be on our family menu a lot! I was pleasantly surprised how easy this vegan curry was to prepare. With only a few ingredients, I put together a delicious, flavoursome supper that all the family enjoyed. It’s so encouraging and reassuring to see Tesco offering such a great variety of family friendly vegan, vegetarian and plant-based recipes on their website (being a mum, I always try to sneak in extra veggies in my daughter’s meals, which doesn’t always work by the way but I do try). What a healthy and flavorful meal! This looks like a delicious dinner! Thank you so much indeed Carlee. What a gorgeous and flavorful curry! Glad to hear that your daughter loves it, too! Thank you so much Jenni. I find it so hard cooking for my daughter (and trying to sneak in all the veggies that she doesn’t like), so it was a great relief she ate this one! This sounds delicious, and your photos are truly mouth-watering! So great that your daughter loved this, too – it’s always the best when you find a new meal that you know your kids love that is also super healthy! Great recipe! Thank you so much for your kind compliment Monica. I’ve had to cook separate meals for my daughter and us adults so many times and it drives me crazy if I’m honest! It’s a real relief when we can all have the same dinner together lol. Yum! This looks so good. 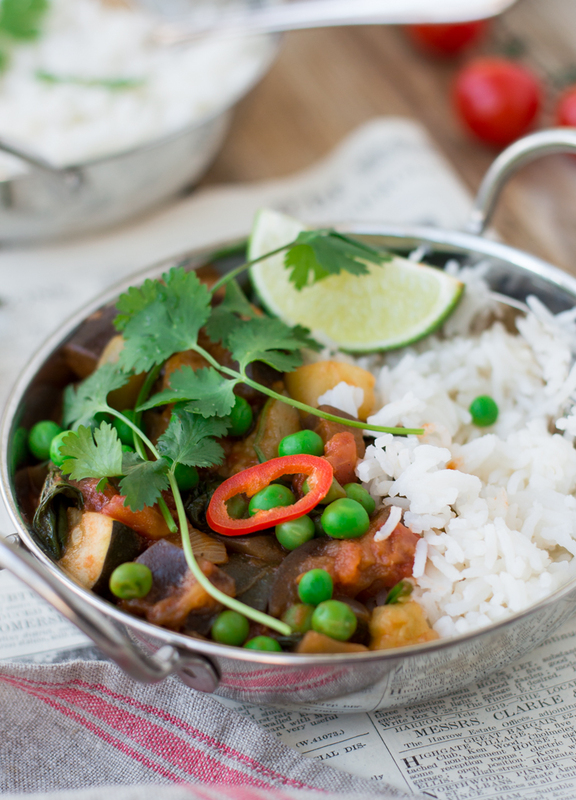 I love Indian curries -the spicier, the better! Than you Malini! It makes both of us the curry lovers! You made it so perfect, My dinner is mostly curries and rice, and I would love to try this curry. looks aweome! I love how colorful this is! Beautiful. Than k you very much indeed Lindsay! Tania, your recipes always make me so hungry! 😛 Thank you for a delicious curry. Will try it soon. That’s one of the more colorful curry dishes I’ve seen – gorgeous! Awww thank you so much for a lovely compliment Dreena! This is just the kind of comforting, hearty meal I could use these past few days. Looks excellent! Curry is one of my favorite dinners! Thank you for sharing, your pictures are beautiful (and making me hungry!)! 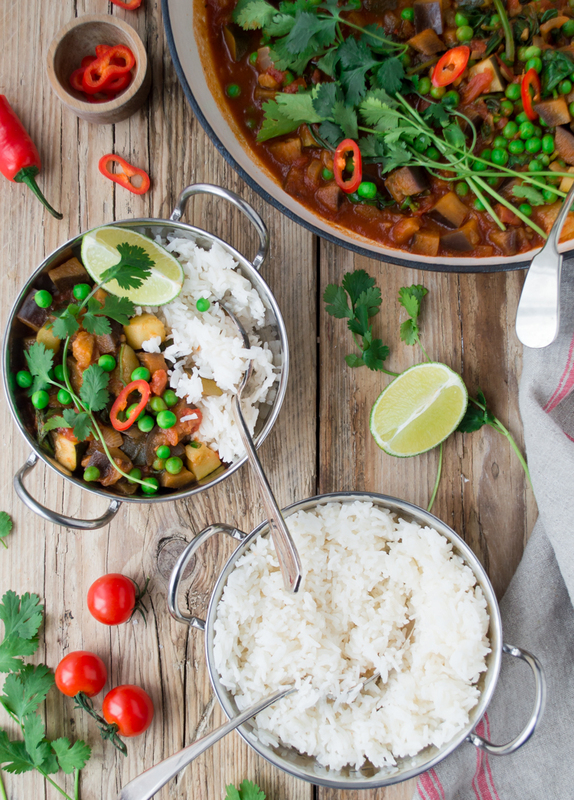 Curries have a special place in our family too! We can’t go too long without it before we start craving it again. So excited to add this to our arsenal of curry recipes. It looks so bright, colorful, and tasty! I’m so glad to hear from the fellow curry lovers Brittany! 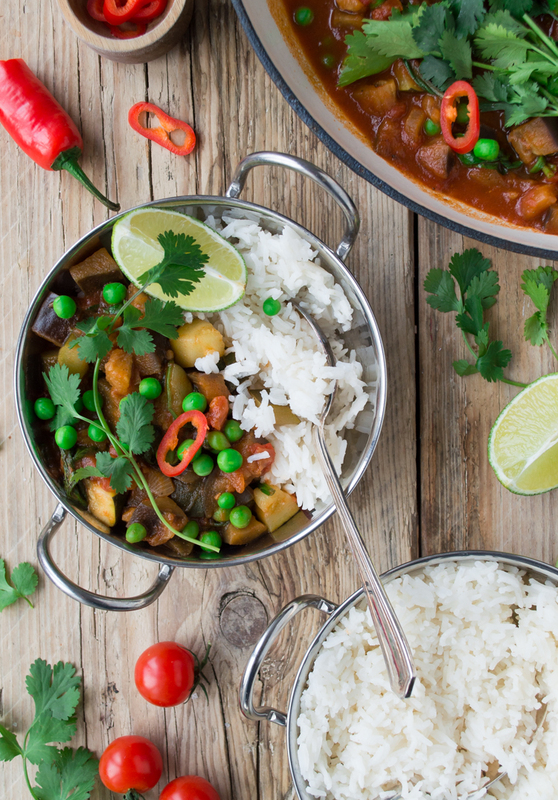 I totally agree – we can’t go too long without a curry either:) And thank you so much for adding this recipe to your delicious arsenal of curries! I love curries and this not only looks delicious but the presentation is so colourful! Not only that but they are quick to prepare and make great leftovers. Love this recipe! Thank you Cleo. 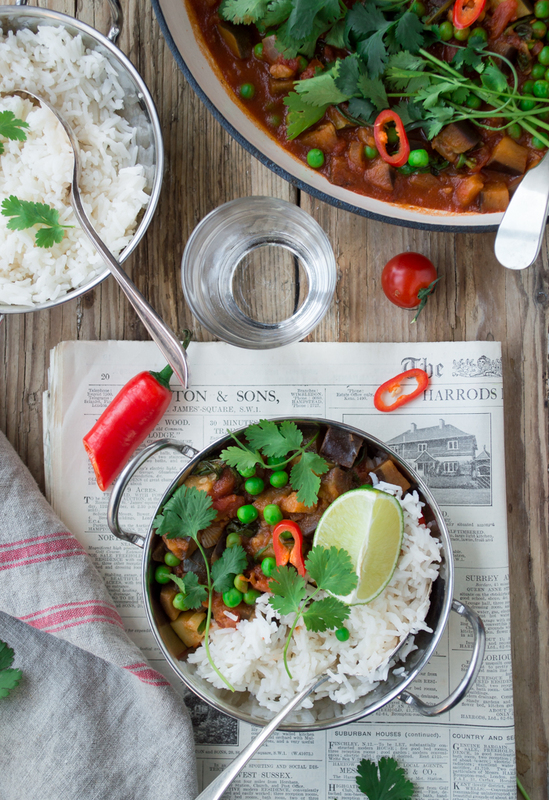 I couldn’t agree more – curries are so easy to prepare and they make great leftovers indeed! I agree completely with what you said about Valentine’s Day! And I agree this curry looks amazing! Thank you so much indeed Chris! I love the ‘soul-hugging’ description you’ve used, can I start borrowing this adjective now please? lol. Curries are so bright and warm! This looks super wholesome and delicious! Thank you Emily, I totally agree with you. What a delicious dinner idea. We love meals like this when it is cold outside! Thank you so much Sandi. Curry, especially in this weather, seems to be the real winner all around! I love curries! This looks really healthy and delicious! Tania your pictures are so so wonderful. I feel all the warm and cozy vibes from this dish. So perfect for winter. Even though it’s getting hot in Miami.. I’ll still add this to my menu haha! Thank you so much Jen! I’m so excited to say I’ll be joining you in enjoying the heat in 2 weeks! We are going on vacation to Miami for 2 weeks and I can’t wait! Have a great weekend. This curry would be perfect right now Tania, to keep me cosy and warm during this big freeze!!! It looks delicious, and I’m not even a curry person 🙂 Beautiful photos, and great job my dear! Curry is one of my go to foods, especially when I’m in a hurry. Love all of the veggies in this recipe! Thank you Linda, I totally agree. Have a great weekend. Curry is one of my favorite meals! It is always so hearty and cozy, perfect for anytime! Thank you very much Jasmine!